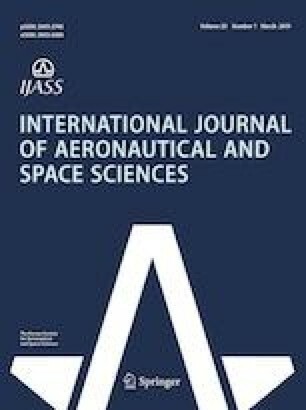 In this paper, the aeroelastic stability of a curved composite hingeless rotor blade in hovering condition is investigated. The composite blade is modeled using the geometrically exact fully intrinsic beam equations, and the aerodynamic loads are simulated by using the two-dimensional quasi-steady strip theory combined with the uniform inflow. The nonlinear governing equations are discretized using a time–space scheme, and the stability of the system is determined by inspecting the eigenvalues of the linearized system. The obtained results are compared with those reported in the literature, and an excellent agreement is observed. It is found that the ply angle of the composite layup and the blade precone angle affect the aeroelastic stability of the blade dramatically. Finally, the effect of initial curvatures on the aeroelastic stability of the composite blade is analyzed. The results highlight the importance of the initial curvature combined with ply angle on the aeroelastic stability of composite blades.